Enjoy a relaxing mountain vacation at the Brownsville Motel in Brownsville, California. As the only motel in the area, we offer a great place to experience the beauty and serenity of the Northern California mountains. 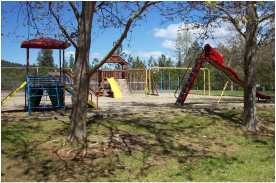 Ponderosa Park is within walking distance from the motel. It is a community park that offers a wide array of amenities to the public. Against a backdrop of pine, oak and Manzanita, lies a recreational are that includes: tennis courts, two baseball diamonds, a paved fitness trail system, an amphitheater/stage area and playground. The Ponderosa Center located within the park serves as the community center and offers a variety of activities for the local area youth. Enjoy our senior or veteran discount of 10% off every night! Other amenities include: handicap access, WiFi, flat screen TVs, air conditioning, and a picnic and barbecue area. Pets are welcome. Credit and debit available on site.